Was your undergraduate in CS? If not, what did you study? I have done my undergraduate in Computer Engineering in Iran. However, CE in Iran includes both Software and Hardware areas. As I chose Software Engineering on the third year, I can say I studied CS. Why did you choose graduate studies and why did you choose graduate studies in CS? At the end of the fourth year of my undergraduate I started a research project with my supervisor and I got truly interested in research and the fact that it's very different from passing courses and submitting assignments. I realized an undergraduate degree won't fulfill my ambition. I needed to explore the areas of Computer Science I was passionate about and that's how I started my master's and later PhD in Computer Science. What is your research area and why did you choose it? During my undergraduate study I took two graduate-level courses called Semantic Web and Knowledge Engineering and Ontology and despite being the only undergraduate in the latter one, I ranked first in both courses. This made me more confident in my field of interest, my knowledge, and my ability to attain and accomplish a master’s degree in this field. Throughout my undergraduate study I realized my passion towards natural language processing (NLP) and text understanding particularly for my native language, Persian. I was very curious to find out how machines can understand what some text is talking about, in the same way that we humans do. For my master's study at York University I started working on word sense disambiguation and machine translation to help machines to understand and process the underlying meanings associated with each word in millions of written texts available on the web. I was keen on beating Google Translate and do a better job in English - Persian translation. And I did! My translator outperformed Google Translate for this language pair and I got a chance to present my paper in a conference in Poland. Who is your supervisor and why did you choose to work with him/her? My supervisor is Olga Vechtomova from the management science department. I was very interested to work with her as her research interests mesh really well with mine. 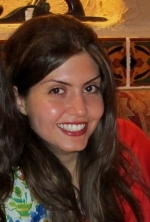 She has done many projects in natural language processing and information extraction. She is open to new ideas and a great researcher. Why did you choose Waterloo for graduate studies? If you did your undergraduate at Waterloo, why did you stay? Waterloo is a great university for Computer Science, with active research labs and a recognized relation with industry. As much as I love being a researcher, I'm determined to work on industrial projects at companies such as Google, LinkedIn, MS Research, etc. I believe UW can help with connecting with recognized research-based companies and prepare the graduate students with the skills they need to be successful in their future career. I lived in Columbia Lake Village North (residence) for two years and really loved the experience. Many people may think Waterloo is a boring city (e.g., as compared with Toronto or other big cities), but what makes Waterloo a very cool place to live in is the live student community and the fact that everyone's living very close by. It's very easy to get together to work, to cook, or to party!